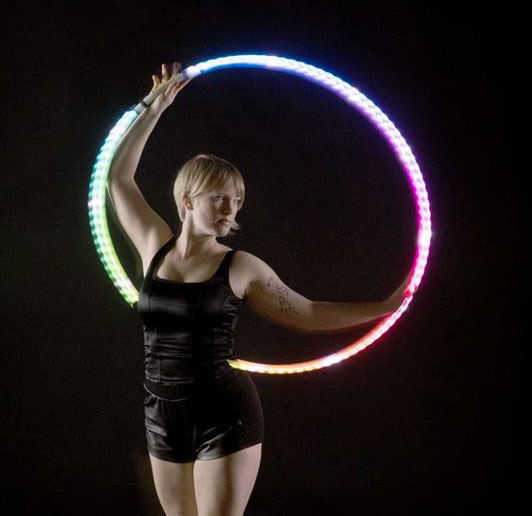 Brynne Flidais strikes a pose with her LED hoop. Brynne Flidais is a local performer, artist, and movement educator. Brynne has been creating innovative dance happenings for stages, dance companies, festivals, flash mobs, major events, and streets throughout the U.S. since 2004. She studied movement science at the university level and earned a science degree in Kinesiology. She gives form to music and rhythm through intuitive dance, structured improvisation, flow art, and choreography. Brynne’s Total Motion dance program is bringing youth dance and hoop classes to Santa Cruz. Brynne hosts Groovy Hoop at the 418 Project for ages 6-17. Groovy Hoop is a fun program for youth who are interested in learning to Hula Hoop. Brynne supplies the hula hoops and the instruction geared toward young learners. This summer, Brynne is bringing Empower Motion camp to Santa Cruz. Empower motion is a camp just for girls featuring movement and dance, hooping, circus and flow arts, and costuming. Empower motion is offered through the Artemis Project. Brynne embarked on a year long project of improvisational dance with moveintuit:everyday.Everyday for a full year, Brynne posted a completely improvisation dance video. All of these videos are posted on Brynne’s youtube account and her website. Below is a compilation that was created when Brynne was halfway through her year of videos. For more information about Brynne and her offerings of dance visit her website, www.moveintuit.com. Brynne… Having seen you when you first encountered the 418, quickly owning the space (not just renting! ), offering hoop & movement classes when you alone sat at your table with postcards, your persistence was impressive. Now, as the 418 Studio & Social Media Manager & consultant to the 418 Board, your impact in the larger community is impressive & your classes are flourishing. This video compilation is wonderful—full of memorable moments too numerous to describe. I salute you. Bravo—you are an inspiration!